Question: Was today’s vintage photo shot in downtown St. Louis? Answer: Does a Shriner wear a funny hat? OK, so the location is obvious, but when was it taken, who are those strange beings in tasseled hats and did they come in peace? 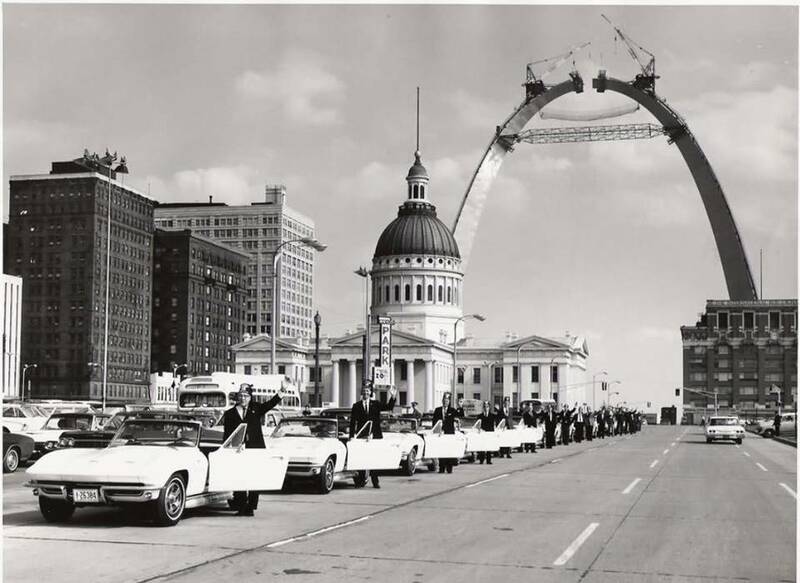 The photo was taken on October 15, 1965, two weeks before the Gateway Arch was topped out on October 28. The men pictured are Tangier Shriners out of Omaha, Nebraska. They were in town to pick up their identical model year 1966 Corvette Sting Ray Convertibles fresh off the St. Louis factory assembly line. Apparently members of that Shriners lodge were offered membership in a “Corvette Patrol” – not a bad side benefit, huh? Have a great Mother’s Day Weekend! Close John. This photo was taken in October 1965.